After successive years being held in the tropics of Queensland, this year’s National Diversity Championships will move to western Sydney. Blacktown will become the hub of entertainment after Townsville hosted the event in 2016 and Cairns in 2015. It is the first time the event has been in New South Wales since being held in Coffs Harbour in 2014. Each year the tournament grows larger and more important as a pathway for players to realise dreams of playing at higher levels. The players have already followed varying pathways to be selected for their states and will receive exposure to talent scouts from AFL teams and be guided by specialist coaches. The event is also a highly important showcase of the indigenous talent within the Under 15 age groups, as well as the multicultural background players across the nation who have embraced the game. The standard of football in recent years has been exceptional as these young and highly talented players display their wares. Many current AFL players have come through this pathway including Steve May (Gold Coast Suns), Curtly Hampton (Adelaide), Callum Ah Chee (Gold Coast), Jade Gresham (St Kilda), Jay Kennedy-Harris (Melbourne), Karl Amon (Port Adelaide), Jarman Impey (Port Adelaide), Jake Long (Essendon) and a host of others across the AFL. There are also many players who have come through the All Nations pathway including Mabior Chol (Richmond), Reuben William (Brisbane Lions) and Gach Nyuon (formerly with Essendon) who are all from Sudan and have reached AFL lists via the All Nations Cup. 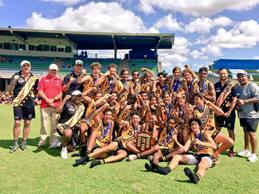 Western Australia are the current title holders for both the Kickstart Championships and the All Nations Cup, taking out the historic double last year in Townsville. Whilst the sandgropers raised the bar in 2016, you can bet that the other states are out to bring down the boys from the west, especially the New South Wales/ACT team as they hope to impress their local AFL clubs, Greater Western Sydney Giants and the Sydney Swans.